The same day Maria Bello revealed that she had fallen in love with her female best friend in The New York Times, she posted a photo of her "modern family" on her Twitter account. "Giving thanks for my modern family. 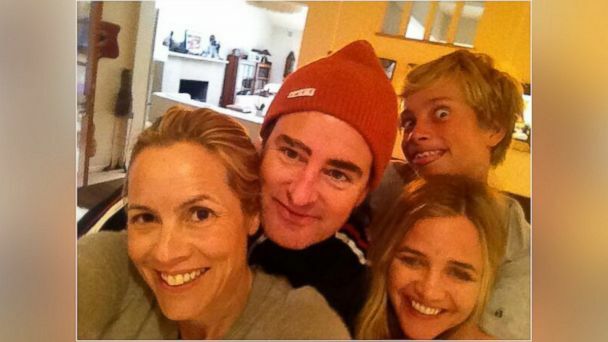 Happy thanksgiving for whatever kind of family you have," she wrote, captioning a photograph of her, her girlfriend Clare Munn, her son Jackson and his father, TV executive Dan McDermott. It wasn't the first photograph Bello had posted of Munn. In September, the 46-year-old "Coyote Ugly" actress posted two photos of herself and Munn, describing her as "my dear friend" in one. In the article published Friday, Bello detailed how her relationship with her best friend had turned romantic and how she and Munn now co-parent her son, along with Jackson's father, and the four have become their own "modern family." "I would like to consider myself a 'whatever,' as Jackson said," she wrote. "Whomever I love, however I love them, whether they sleep in my bed or not, or whether I do homework with them or share a child with them, 'love is love.' And I love our modern family." Now that Bello has taken their relationship public, here are 5 things to know about Clare Munn, her new love. In the Times article, Bello described meeting Munn in a bar "wearing a fedora and speaking in her Zimbabwean accent." "We had an immediate connection but didn't think of it as romantic or sexual," Bello wrote. "She was one of the most beautiful, charming, brilliant and funny people I had ever met, but it didn't occur to me, until that soul-searching moment in my garden [two years later], that we could perhaps choose to love each other romantically." Munn later joked during the 2013 TEDWomen conference that it's her accent which attracts people. "Americans seem to be very fascinated with the accent. That's probably the only reason I have friends actually." Like Bello, Munn is a longtime social activist and entrepreneur. The CEO and founder of social impact media company The Communication Group, Munn started her own NGO or non-governmental organization in her native Zimbabwe when she was just 20 and continues to work with women all over Africa. During an introduction at a recent keynote speech in New York City, Bello told the audience that Munn has raised over $25 million to start several successful technology marketing and branding companies. Bello currently serves on the board of Munn's Communication Group. Munn refers to Jackson as her "godson." Bello described in the Times article the process of trying to tell her son how she had "become involved with a woman who was my best friend, and, as it happens, a person who is like a godmother to my son." During Bello's introduction of Munn at the New York keynote speech, she also revealed who does the cooking in the family. "She's … a very bad cook," Bello said. Munn agreed. "You're definitely a better cook than I am," she said. But Munn makes up for it with her smarts. "Her accent makes her appear really smart," Bello told the audience. "But the truth is, she is really smart and half the time I have no idea what she's even talking about." Munn revealed during an interview at TEDWomen that she is "rather dyslexic. I've really managed to overcome much of my dsylexia," she said, adding that she was "thrilled" to have the learning disorder. "I have no apologies about that because I see things differently," she said.